While CBS News coverage of the State of the Union speech showcased the bombast of New York Times columnist Tom Friedman, the ABC News coverage was the most hostile to Bush and conservative policies with its analysis delivered through a liberal prism. Anchor Elizabeth Vargas resurrected Watergate as she highlighted how Bush's 42 percent approval level "is the worst for a President entering his sixth year in office since Watergate hammered Richard Nixon." 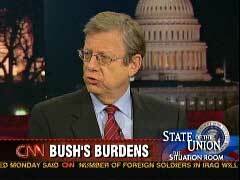 Charles Gibson noted that Bush "tries to unite," but then painted Democrats as victims of Bush deceit as he stumbled through an adage which many have mocked Bush for once messing up: "'Fool me once, ah, shame on you. Fool me more than once, fool me twice or ten times, shame on me.'" Following the speech, Vargas noted how Bush had offered an "olive branch" to Democrats. That prompted Gibson to again suggest that Bush is more to blame for partisan fighting. Dr. Tim Johnson, a "single-payer" advocate, complained that on health care Bush "was just...tinkering with the system that is basically broken." ABC uniquely highlighted the Spanish language Democratic response from LA Mayor Antonio Villaraigosa. Vargas relayed how he "blamed the Bush administration's, quote, 'reckless policies for increasing the national debt, the number of uninsured Americans, including 39 percent of Latinos, and the number of failing students and the ranks of the poor.'" As if one Democratic response were not enough. Picking up on President Bush's assurance, in his Tuesday night State of the Union address, that military decisions in Iraq will be made by military leaders, MSNBC's Chris Matthews and Joe Scarborough rejected the notion of any such military independence, but during ABC's coverage, when Charles Gibson similarly questioned if the military will be able to determine troop levels, retired General Jack Keane, Vice Chief of Staff of U.S. Army from 1999-2003, maintained that the feared political pressure is an illusion. Matthews asserted that the Generals in Iraq were not "really given the freedom to say how many troops they needed because when Shinseki said this is going to take a couple of hundred thousand troops, not a hundred thousand troops, he was cashiered. So this idea that these guys are free to think out loud, I thought, has been yet to be proven." Scarborough echoed: "They parrot, for the most part, the Generals and the Admirals, 99 percent of them parrot" the Pentagon. Keane contended on ABC that the idea that "the military commanders are under some kind of pressure from the administration" is false and military commanders will "call the shots as they see them." President Bush didn't play for with Democrats in 2002, MSNBC's Chris Matthews complained to Senator John McCain just before 11pm EST Tuesday night. 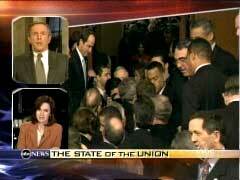 Raising how in his State of the Union address Bush had made an "appeal for comity, for civility," Matthews charged when Bush wanted authorization for military action against Iraq, "he jammed that vote right up against the election of 2002. That wasn't a very civil thing to do, to force the Democrats to vote right before an election to give him basically full authorization to do what he wanted to do, but wouldn't say what it was. Was that a civil move?" McCain rejected Matthews' premise and reminded Matthews of how "we had taken a vote during the Clinton administration that had called for the overthrow of Saddam Hussein." Matthews countered: "But that was by democratic means, not by war." The saying goes that the Palestinians never miss an opportunity to miss an opportunity. Along the same vein, NBC's Tim Russert never misses an opportunity to denounce a tax cut or pass along arguments in favor of raising taxes. And NBC anchor Brian Williams didn't even have to mention taxes to lead Russert, a few minutes after President Bush finished his State of the Union address Tuesday night, to fret about how Bush hasn't raised them. Williams noted how President Bush "is known to be very frustrated at what he sees as a large part of the population in the country, and in that chamber tonight, that doesn't seem to agree with his message that this is a nation at war." Russert retorted: "Critics have responded by saying well, if that's the case, Mr. President, ask people for sacrifice. Democrats have pointed out it's the first war we've been involved in where the President hasn't raised the revenues or the taxes in order to pay for it." Before President Bush's Tuesday State of the Union address, at least three network reporters seemingly read from the same talking points as they described the public mood with the exact same word: "sour." On World News Tonight, ABC's George Stephanopoulos insisted that "the country is just in a sour mood." About 90 minutes before Bush's address, CNN's Jeff Greenfield wondered "whether the President can connect with a populace that is in a sour, pessimistic mood?" He pointed out how "only Nixon, in the year of his resignation, had a lower job approval rating," before echoing his earlier question: "I think the President would like the country to believe he feels their pain or at least their anxiety about health care, about jobs, about the whole sense that something's gone a little sour." 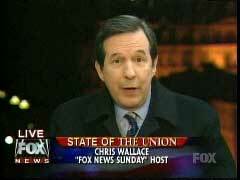 Then on Fox, minutes before Bush began, Chris Wallace attributed the "sour" assessment to Bush as he predicted Bush would deliver a "presidential pep talk where he believes that the country has, the mood has turned sour -- sour on the war, sour on the economy, sour on the government's response to Katrina." Afterward, Wallace described the speech as "tough in terms of the war in Iraq and people souring on that." Of the three broadcast network evening newscasts on Tuesday, ABC's World News Tonight delivered the most downbeat take on the public attitude facing President Bush as he delivers his State of the Union (SOTU) address. Anchor Elizabeth Vargas framed the evening around how Bush "is coming off the worst year of his presidency, from the botched response to Hurricane Katrina, to record-high energy prices, to growing unhappiness with the war in Iraq." George Stephanopoulos soon insisted that "the country is just in a sour mood," as evidenced by Bush's 42 percent approval rating, "ten points below where it was last year." Stephanopoulos added: "And for the first time in his presidency, a majority of Americans...want to follow congressional Democrats rather than President Bush: 51-35." Stephanopoulos, however, did allow that "on the other hand, President Bush is still very strong on national security." While CBS News coverage of the State of the Union speech showcased the bombast of New York Times columnist Tom Friedman, the ABC News coverage was the most hostile to Bush and conservative policies with its analysis delivered through a liberal prism. Anchor Elizabeth Vargas began the evening by emphasizing Bush's low approval rating fueled by "an inept response to Hurricane Katrina, and the indictment of a high ranking White House official and, of course, growing dissatisfaction with the war in Iraq." She resurrected Watergate as she highlighted how Bush's 42 percent approval level "is the worst for a President entering his sixth year in office since Watergate hammered Richard Nixon." Charles Gibson noted that Bush "tries to unite," but then painted Democrats as victims of Bush deceit as he stumbled through an adage which many have mocked Bush for once messing up: "A lot of Democrats feel this has not been a uniting President. They have gone down that road before trying to work with the President, and of course the old expression is, ah, 'Fool me once, ah, shame on you. Fool me more than once, fool me twice or ten times, shame on me.'" Following the speech, Vargas noted how Bush had offered an "olive branch" to Democrats. That prompted Gibson to again suggest that Bush is more to blame for partisan fighting: "Yes, he did. And you wonder if he had done this four years ago, five years ago, if indeed there might have been greater comity in the city of Washington, greater cooperation in the city than there has been so far through the Bush presidency." Gibson also relayed the odd analysis, from ABC's political team, that of 62 paragraphs in the speech, "48 could have been given verbatim by President Bill Clinton." Dr. Tim Johnson, a "single-payer" advocate, complained that on health care Bush "was just...tinkering with the system that is basically broken." Of the broadcast networks, ABC uniquely highlighted the Spanish language Democratic response from LA Mayor Antonio Villaraigosa. Vargas relayed how he "blamed the Bush administration's, quote, 'reckless policies for increasing the national debt, the number of uninsured Americans, including 39 percent of Latinos, and the number of failing students and the ranks of the poor.'" As if one Democratic response were not enough. Elizabeth Vargas: "After what is by most accounts the most difficult year of his presidency, many would say undoubtedly the worst, the President has seen his approval ratings sag, in part due to high gas prices and an inept response to Hurricane Katrina, and the indictment of a high ranking White House official and, of course, growing dissatisfaction with the war in Iraq.....Getting back to the President's approval ratings, Charlie, this has been a tough year for him. The latest ABC poll shows his approval rating now at 42 percent, which is the worst for a President entering his sixth year in office since Watergate hammered Richard Nixon." Charles Gibson: "Yes, and other polls actually have him lower than 42 percent. And you expect in a speech like this, when your polls are low, that perhaps he worries about his political base, and a President is more likely to reach out to the other party and try to find some avenue of bipartisanship in a speech like this when he is having trouble. He tries to unite, but of course a lot of Democrats feel this has not been a uniting President. They have gone down that road before trying to work with the President, and of course the old expression is, ah, 'Fool me once, ah, shame on you. Fool me more than once, fool me twice or ten times, shame on me.' so it's an interesting thing to watch tonight as to how much he does reach out to the Democrats in the Congress, and how many applause moments there will be from the Democrats. There'll be plenty from the Republicans. The question is: Will the Democrats find something to like in this. They may like some of the generalities that the President talks about, but of course the specifics then get a little tougher when they get into actually writing legislation." Vargas: "He reached out many, many times to the Democrats, and reached out with an olive branch on many occasions, repeatedly expressing that he wants everybody's advice, he wants to work with them, he says, to get these things achieved. The question, of course, being whether or not Democrats will be able to embrace and accept the olive branch. Charlie, it was remarkable how many times he did, in fact, reach out." Gibson: "Yes, he did. And you wonder if he had done this four years ago, five years ago, if indeed there might have been greater comity in the city of Washington, greater cooperation in the city than there has been so far through the Bush presidency." Gibson: "I just got something from our political staff, our political people, who were trying to gauge the speech in terms of is it very partisan Republican or not? And as a measure of how much President Bush was rhetorically reaching out, they estimated, this is their analysis, but it is interesting, of the 62 paragraphs in the speech, they came to the conclusion that 48 could have been given verbatim by President Bill Clinton. So interesting that there is a different tone, perhaps, from the President this time." Vargas, over brief video of the Mayor: "This year, in addition to the Democrats' response from Governor Kaine of Virginia, Mayor Antonio Villaraigosa of Los Angeles offered a response in Spanish that was broadcast on Spanish language channels. 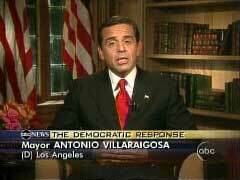 Mayor Villaraigosa is another rising star in the Democratic Party, elected in May of 2005. He's already been on the covers of many newsweeklies. The Mayor was speaking from his residence in Los Angeles and he stressed the best days for this country are ahead, saying let's talk about the real state of the union. Villaraigosa blamed the Bush administration's, quote, 'reckless policies for increasing the national debt, the number of uninsured Americans, including 39 percent of Latinos, and the number of failing students and the ranks of the poor.' He said Democrats want to fix those problems and end what he calls 'the culture of corruption' in government." "He was just talking about tinkering with the system that is basically broken. I wish the President, or for that matter any politician, would be courageous enough to step up to the plate and say we've got a real problem with our system or non-system in this country. After all, we spend about twice as much per person on health care in this country as any other industrialized country. Yet we have 45 million insured [meant "uninsured"], and we rank 37th in life expectancies, 41st in infant mortality. We've got a mess on our hands. And all of the politicians, Bush, talk about is a little bit of tinkering here on the edges. We need to say we've got a fundamental problem. We have to change the system." Joe Scarborough: "Now, I thought it was very interesting also, the part of the speech where there was the biggest division seemed to be where the President said we were winning the war in Iraq, and then he followed up and said military decisions are going to be made by military leaders and not politicians in Washington, D.C. Obviously, we all immediately thought of Lyndon Johnson in the White House picking bombing targets during Vietnam. Democrats stayed seated, Republicans stood up." 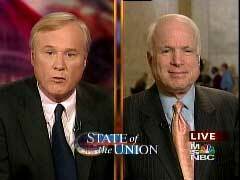 Chris Matthews: "You know what I thought at that time? I thought I didn't think any of these Generals over there were really given the freedom to say how many troops they needed because when Shinseki said this is going to take a couple of hundred thousand troops, not a hundred thousand troops, he was cashiered. So this idea that these guys are free to think out loud, I thought, has been yet to be proven." Scarborough: "And that's the thing that always irritated me on the Armed Services Committee where you'd have the Generals come up and they'd be speaking for the President. It was Bill Clinton when I was on the Armed Services Committee. Now it's George Bush. They parrot, for the most part, the Generals and the Admirals, 99 percent of them parrot what the Pentagon and what the-"
Scarborough: "Or else, and what the President wants." "The President said a couple of things, one, he said we are on the offensive in Iraq with a clear plan for victory. I wonder if military leaders really sense that there is a clear plan for victory. The military leaders that you know that are actually over in the theater. And secondly, he said those military commanders will make the decisions on when to withdraw, not the politicians in Washington. He got huge applause for that. But is that really true? Will they say to the President when it's time to go out?" 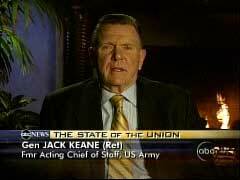 Retired General Jack Keane, Vice Chief of Staff of U.S. Army 1999-2003, from in front of a fireplace at a remote location: "Let me take the last one first. It's been sort of conventional thinking that the military commanders are under some kind of pressure from the administration, particularly Secretary Rumsfeld, imposing their will on them and somehow they're coopting their free thinking about what really is the situation and when should we withdraw the troops. The fact of the matter is that those commanders who I know personally, are absolutely standup people. They're going to call the shots as they see them, as the American people would expect them to do so. And that's what they've been doing all along." Matthews: Bush a Phoney on "Civility"
Matthews to John McCain, who was inside the Capitol: "What did you make of the President's appeal for comity, for civility? And I just want to offer one demurral here. I do remember that back when he wanted something, you could argue, in the worst way, which was authorization for possible military action against Iraq, he jammed that vote right up against the election of 2002. That wasn't a very civil thing to do, to force the Democrats to vote right before an election to give him basically full authorization to do what he wanted to do, but wouldn't say what it was. Was that a civil move?" McCain: "I think the situation in Iraq called for that vote to be taken. We had taken a vote during the Clinton administration that had called for the overthrow of Saddam Hussein." Matthews: "But that was by democratic means, not by war." Brian Williams: "Tim, it's also been noted the President is known to be very frustrated at what he sees as a large part of the population in the country, and in that chamber tonight, that doesn't seem to agree with his message that this is a nation at war. He's expressed frustration over and over on that." Russert: "He has. Critics have responded by saying well, if that's the case, Mr. President, ask people for sacrifice. Democrats have pointed out it's the first war we've been involved in where the President hasn't raised the revenues or the taxes in order to pay for it. The deficits have gotten bigger." Russert's intensity on the issue may have diminished, but not his commitment to his viewpoint. Word of the Night for Public Mood, "Sour,"
"Well, Elizabeth, the country is just in a sour mood. Coming into this speech tonight, the President's approval rating is at 42 percent, ten points below where it was last year. And for the first time in his presidency, a majority of Americans believe, want to follow congressional Democrats rather than President Bush: 51-35. On the other hand, President Bush is still very strong on national security..."
Paula Zahn: "What are you looking for tonight in this speech?" Jeff Greenfield: "Whether the President can connect with a populace that is in a sour, pessimistic mood. You know, I abhor most poll overemphasis, but there's a number in a recent poll that this network did. Have things gotten better or worse in the last five years? A nice general question, how do you feel? 64-28, worse. And except for terror, the President gets negative marks on every single issue. Only Nixon, in the year of his resignation, had a lower job approval rating, you know, for sixth year in office than this guy. So the question is, to quote what a former president never quite said, I think the President would like the country to believe he feels their pain or at least their anxiety about health care, about jobs, about the whole sense that something's gone a little sour." Zahn: "And yet this is still being billed as a very optimistic speech." Greenfield: "Oh yeah, I mean, you, I don't-"
Zahn: "Like a 'feel your pain' and inspiring at the same time." Greenfield: "Well, Jimmy Carter taught every future president you better not go in front of the country and tell people things are sour. You don't say that. It's not, it's almost literally un-American." Wallace at 9:02pm EST: "I think what we're going to see tonight from the President is a pep talk, in a sense, a presidential pep talk where he believes that the country has, the mood has turned sour â€" sour on the war, sour on the economy, sour on the government's response to Katrina. And I think what you're going to get very much, Shep, is a sense of 'can do,' that he's got a plan for victory in a Iraq, he's got a plan to confront the mullahs in Iran, he's going to have a domestic agenda..."
Wallace just after Bush finished: "I think you have to view it in the political context. 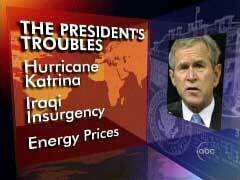 This is a president who had a very rocky first year of his second term -- 2005 was, it was just tough. It was tough in terms of the war in Iraq and people souring on that, tough in terms of the anger that a lot of people felt with the failure of the government response to Katrina, tough with the increase in energy prices. And this was a President who was trying to turn that around, trying to say I've got a path for victory in Iraq, I've got a plan to lead the country forward, don't sour. It was, in a sense, a presidential pep talk." "Good evening. We are in Washington in anticipation of the President's State of the Union address tonight. Even before he takes the microphone at the nation's capital, it already has been a very eventful day here. 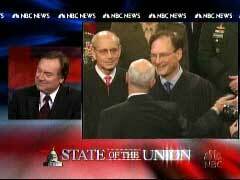 The Senate confirmed Judge Samuel Alito as the newest Supreme Court justice, a political triumph for President Bush. Tonight's speech will be his sixth annual address to Congress. He is coming off the worst year of his presidency, from the botched response to Hurricane Katrina, to record-high energy prices, to growing unhappiness with the war in Iraq. Tonight, the President seeks to seize control of the agenda and set a new course for the year ahead." Vargas: "The President faces some formidable political challenges tonight. We're joined now by ABC's chief Washington correspondent, George Stephanopoulos, and, George, as we said, 2005 has taken a real toll on the President. Just how big are his challenges? How does he expect to turn this around tonight?" Stephanopoulos: "Well, Elizabeth, the country is just in a sour mood. Coming into this speech tonight, the President's approval rating is at 42 percent, ten points below where it was last year. And for the first time in his presidency, a majority of Americans believe, want to follow congressional Democrats rather than President Bush: 51-35. On the other hand, President Bush is still very strong on national security, which is why, as Martha pointed out, he's going to put a real focus on that tonight." Vargas: "He really faces several audiences tonight. Among them, the nation at large as well as the Congressmen. Americans at home and congressmen sitting right in front of him. How difficult will it be to get those Congressmen, especially the Democrats, behind him, given the tenor and tone in Washington these days?" Stephanopoulos: "Well, it is a real poisonous atmosphere up here. The President has helped himself with his conservative base. He had some trouble with them after Katrina, but the swearing in of Justice Alito today really helps firm them up. But the Democrats are going to be a huge problem for him. Elizabeth, you and I got a taste of that when we met with the Democratic leader, Harry Reid, today. Right out of the box, he told us, 'I expect the President to do exactly the opposite of what he says.' There is just not a lot of trust up here right now." Vargas: "Boy, there sure isn't. We saw it. All right, George Stephanopoulos, thanks so much."